Susan Montoya Bryan for the AP has a long piece on the current state of the market in tribal artifacts. She notes that collectors and dealers at the Whitehawk Antique Show seemed more cautions about buying objects, fearful perhaps of incurring criminal liability. 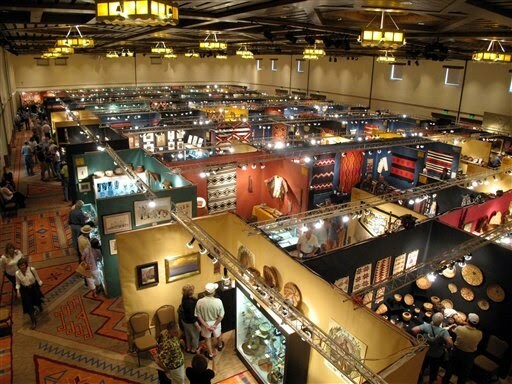 The dealers at the Santa Fe show, many of whom have been collecting and selling Indian artifacts for more than two decades, said they were concerned about their reputations because of a growing public perception that anyone involved in the trade could be involved with the criminal element that’s being targeted by federal agents. Every week, Knox said he has to run someone out of his gallery for trying to sell him stolen pots. “I post my rules so people know I’m not going to deal with anything shady,” said Knox, a retired police officer. Knox shrugged off the concerns, saying the caliber of dealers at the show is such that they have nothing to worry about. While they don’t condone looting or the trafficking of illegal artifacts, many dealers said the federal government has been liberal in its interpretation of archaeological resource protection laws and heavy-handed in its effort to crack down. Mac Grimmer, a Santa Fe dealer who has helped assemble many antique Indian art collections, said there have been crackdowns in the past and the market eventually settles down. But this could be different, he said. Previous Previous post: More Repatriations to Italy Likely? Welcome to the Illicit Cultural Property Blog. I started writing here in 2006 as I was undertaking my PhD research into cultural heritage law at the University of Aberdeen. I work to provide regular updates on thefts, antiquities looting, and legal developments in the field. I am a Professor at South Texas College of Law Houston where I teach art and cultural heritage law, among other subjects. Tree painting, moral right or an environmental message? Babcock on "The Public Trust in Public Art"